I just returned from one of the most stimulating and interesting Kierkegaard conferences I have been to in many years. 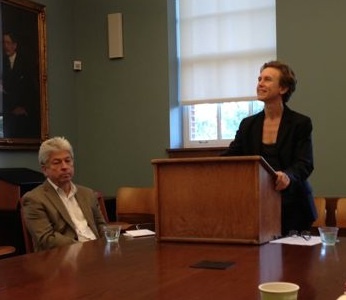 The conference was hosted by the Humanities Center at Johns Hopkins University, with support provided by the Office of the Dean of the Zanvyi S Krieger School of Arts and Sciences, the Max Kade Center for Modern German Thought, and the Department of German and Romance Languages and Literatures at Johns Hopkins. The conference ran all day Friday and Saturday, Sept. 20th and 21. Peter Taksøe-Jensen, the Ambassador of Denmark to the United States, and Katherine Newman, James B Knapp Dean of the Zanvyi S Krieger School of Arts and Sciences gave the opening addresses on Friday after which there were four papers. The very first speaker was Pia Søltoft, the director of the Søren Kierkegaard Research Center (formerly an independent institution but now part of the University of Copenhagen). It was a rare treat for me to see Pia. I had done some translation work for her when I lived in Copenhagen, but despite the fact that I have been back to Denmark many times since I left in 1998, twice even for conferences, our paths hadn’t crossed. If there were fashion awards for scholars, Pia would win one. She is always fabulously turned out! The title of Søltoft’s talk was “The Transparency of Self-Love? Kierkegaard vs. Frankfurt.” Søltoft summarized both Kierkegaard’s and Frankfurt’s positions on the nature of love and self love and argued that Kierkegaard departed from Frankfurt in that his account of love did not involve an identification of the lover with the interests of the beloved. I pointed out during the question period, however, that I believe this position rests on a conflation of desire and interest. What Søltoft pointed out was that Kierkegaard does not believe that simply giving someone what they profess to want is necessarily loving. Sometimes people desire things that will be injurious to them, hence, according to Kierkegaard, to endeavor to satisfy such a wish is not loving. Søltoft is absolutely right there. It is simply mistaken, I would argue, to take desires to represent interests. The second presentation was by Hent de Vries of Johns Hopkins. The title of his talk was “The Kierkegaardian Moment: Dialectical Theology and its Aftermath.” De Vries talk, and the first talk of the afternoon “Constantine Constantius Goes to the Theater,” by another professor from Johns Hopkins, Michael Fried were both erudite and informative. 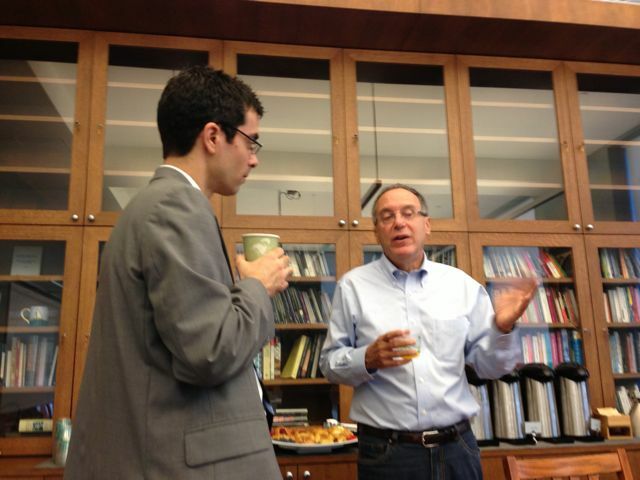 Following Fried was Jonathan Lear from the University of Chicago. Lear’s talk was entitled “On a Possible Use of Disjunction in the Late Journals of Søren Kierkegaard, 1854-1855.” Lear began by explaining that his title was meant to be humorous and proceeded to give a really wonderful presentation on the difficulty of understanding what it means to be human, with special emphasis on Socrates and irony. Lear has a new book entitled A Case for Irony that is rich in references to Kierkegaard and hence must reading for serious Kierkegaard scholars. Given the quality of Lear’s book on Freud, which I finished reading just before the conference, I’d say that pretty much anything Lear writes is well worth a read. Lear is a self-professed long-time Kierkegaard lover and often includes references to Kierkegaard in his works. Kosch’s paper opened with an anecdote which, if I remember correctly, goes like this: One day the chair of her department was one his way in to school for a meeting when he fell down the stairs in his house and had, according to his own words, “the wind knocked out of him.” He made it to the meeting, however, despite the accident, and learned only later that he’d actually suffered several cracked ribs and a collapsed lung. If he had called in to say that he could not, in fact, make it to the meeting, explained Kosch, no one would have questioned the statement. Everyone would have accepted his claim that he was simply unable to make it to the meeting because of his accident. And yet, he had actually been able to make it to the meeting. So where does that leave us with respect to the project of determining the relation between what we can do relative to what we ought to do? This was the subject of Kosch’s fascinating presentation. She said in conversation afterward that she thinks the presentation is too rough at this point to try to publish. If that’s true, then her standards are indeed high because I thought it was extraordinarily rigorous and that the topic it addresses is one of the most important in ethics/action theory, if not in philosophy more generally. After Kosch came Vanessa Rumble who spoke on Kierkegaard and Schelling. Rumble’s work is always interesting and this paper was no exception. Next was Lore Hühn of the University of Freiburg. Hühn gave an equally interesting and informative presentation on “negativity” in Hegel, Kierkegaard and Adorno. I enjoyed both these papers immensely, and was particularly pleased to meet Professor Hühn because in addition to being an excellent scholar, she is the president of the International Schelling Society. David Kangas, of Cal State Stanislaus, gave the last paper before lunch, entitled “The Nowhere of Truth: Kierkegaard’s Discourse on the Occasion of Confession.” Kangas is one of the few scholars giving serious analytical attention to Kierkegaard’s religious discourses. It’s strange that these works have not received more attention given that Heidegger considered they contained more philosophical substance than anything else Kierkegaard had written. Kangas’ presentation, which developed the idea that the act of confession was not really an act at all, but a particular kind of inaction (for want of a better word), was one of the most original and thought provoking of the entire conference. I was honored to chair the last session of the conference where the first presenter was my long-time friend Edward Mooney of Syracuse. It was Mooney who approached me about translating Kierkegaard for Oxford, and Mooney who did the introduction to that book, so I was very grateful to be able to thank him publicly for his long friendship and support. The title of his presentation was “Dependence and its Discontents: How Self is Sustained by Another” and was a lyrical exploration of its subject in the spirit of Kierkegaard’s own writing. This was not surprising given that Mooney is a published poet as well as a scholar. The last speaker of the conference was Michael Finkenthal of Johns Hopkins whose paper was entitled “Kierkegaard in Romania before WWII: Reception and Rejection.” There were several scholars from Johns Hopkins on the program. What distinguished Finkenthal, however, was that he is not a philosopher, theologian, or literary scholar–he’s a physicist! He’s in the Department of Physics and Astronomy at Johns Hopkins. He’s published extensively in that field, but has somehow also managed to publish several works of philosophy and or intellectual history including one on Cioran, another on Shestov, and a third on Benjamin Fondane. The highlight of the conference, however, was the dinner on Friday evening. 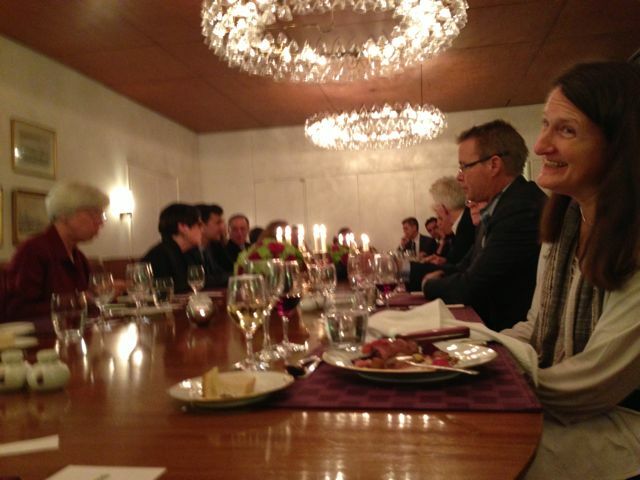 Peter Taksøe-Jensen, the Ambassador of Denmark to the United States, invited all the conference participants to a dinner at the Danish Embassy in Washington. It was by far the best conference dinner I had ever been to and a lovely gesture on the part of the Ambassador and the Danish government more generally. The embassy is absolutely beautiful, decorated in the impeccably understated style specific to the Danes. No one has so well developed a sense of style as the Danes! Special thanks have to go to the other session chairs: Ruth Leys, Paola Marrati, and Eckart Förster of Johns Hopkins and Kristin Gjesdal of Temple University, and, finally, to Leonardo Lisi of Johns Hopkins, who organized the conference and shepherded the participants about the beautiful campus. I can only imagine how much work must have gone into that! Why didn’t you make a post about the course on Kierkegaard on coursera? Send me a link and I’ll do that!